The GE Datex-Ohmeda Avance anesthesia machine is a compact, integrated, and intuitive anesthesia delivery system. It provides electronic gas mixing and optional respiratory gas monitoring with a wide range of clinical information management systems. Electronic gas mixer with pneumatic back-up control. Four patient case configuration options and four pages to enhance usability. Minimal number of parts and tube connections. Ease of disassembly, no tools are necessary. Fully autoclavable and latex-free components. PSVPro® (Pressure Support with Apnea backup mode). Synchronized Intermittent Mandatory Ventilation (SIMV) (Volume and Pressure). Pressure Controlled Ventilation-Volume Guaranteed (PCV-VG) - * Optional. One motion from mechanical to manual mode. Two key presses to total standby: end case. Generous storage and work surface space. Integrated cable and tube management. Height: 52.9 in (134.5 cm). Width: 28.3 in (72 cm). Depth: 28.7 in (73 cm). Weight limit: 75 lb. (34 kg). Width: 26 in (66 cm). Depth: 15.75 in (40 cm). Questions about our Anesthesia Machines? 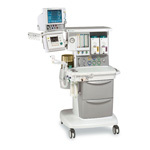 Soma Technology, Inc offers a wide range of anesthesia machines. If you have any questions about any of our anesthesia machines or need a quick quote, call 1-800-GET-SOMA and one of our knowledgeable sales representatives will help you.